In Pure’s own words, the Pure Siesta Rise makes ‘going to bed a real pleasure’. The stylish, futuristic design sets it apart from many of its contemporaries, but with a premium price tag. Some might think that this would turn prospective buyers away. However, this DAB/DAB+ and FM clock radio has an impressive collection of features for its premium cost. Included are twenty station presets, tone alarms and a CrystalVue display to name but a few. The Rise is a recent addition to the Pure line-up, replacing the Siesta Mi Series 2. Where the Mi display featured a single display for both time and station name, the Rise shows these separately. The Rise adjusts automatically for daylight saving and won’t keep users awake with its auto-dimming clock-display function. This is a potential problem with normal backlit DAB radios. The radio also provides a USB port for mobile phone charging. The external adapter for the radio also connects via USB. Users can program up to three independent tone/radio alarms, and make use of an adjustable snooze and sleep timer for lazy days. For discreet listening users can plug in headphones via an included mini-jack input. Weighing in at 521g and compact in size, the Rise is ideal for those wanting a practical bedside clock radio that thinks for itself. By way of USB connection, users can update the software of the radio with an update application from Pure themselves. ‘Engineered and hand tuned’ by Pure’s audio experts in the UK, the Siesta provides high-detail digital quality reception. The product also includes a standard 3-year warranty. The Pure Siesta Rise is Digital Tick approved. This means it’s ready for the future with DAB, DAB+ and FM reception. 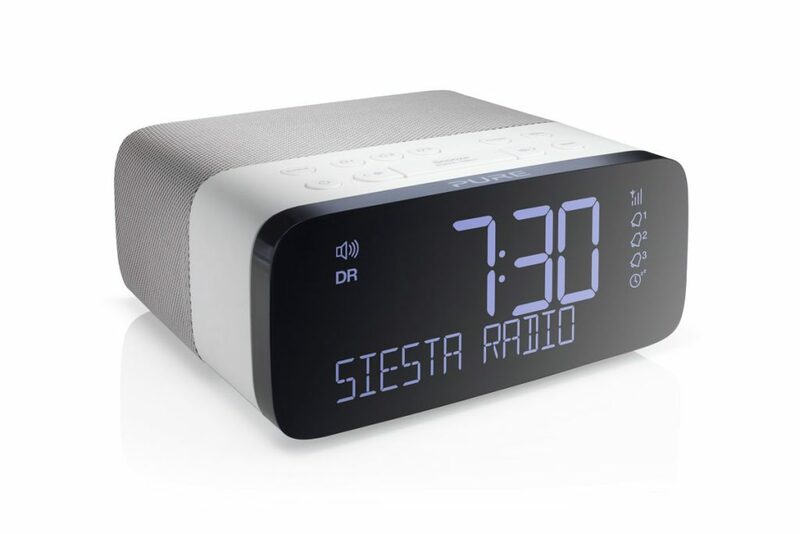 For a premium radio, the Pure Siesta Rise provides a handful of essential features, packaged in a sleek, tasteful exterior, while paying special attention to current trends in additional features with its USB powerport and software-update capabilities. Verdict: A premium all-rounder clock radio from Pure, equipped with a power-port for phone charging and software update capability.